Lord Ganesha has the head of an elephant and has a mouse as a vehicle. The elephant is well known for its intelligence. Lord Ganesha has the elephant face as a symbol of high intelligence. Ganesha is master of the intellect and wisdom. Worshipping Ganesh Yantra blesses with increased concentration, knowledge, focus and success. Ganesh Yantra is written in accordance to canons in auspicious lagna & mahurta and tantra as be recited and Yantra is purified. This Yantra is composed of six triangles, closed on all the sides. 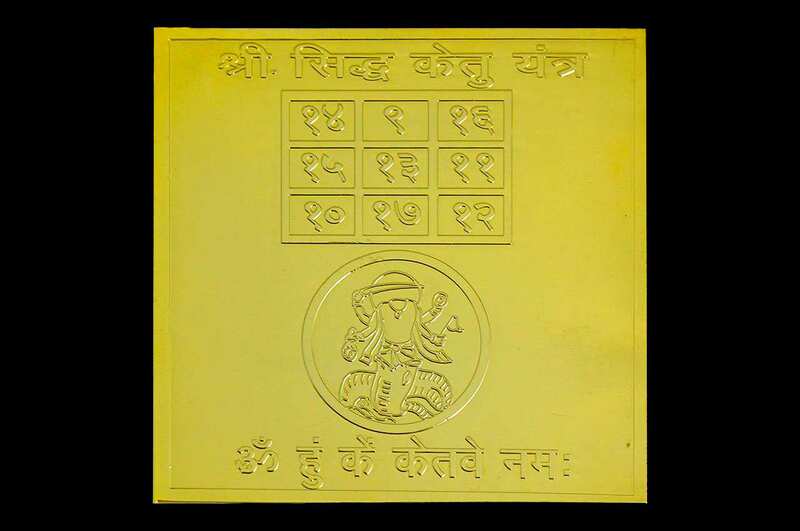 The Beej word (Gang) is recited for purifying the Yantra. O Mantra : Om Gaan Ganapataye Namaha. O Design : Made in 24 ct gold plated copper. Long lasting finish with superfine etching. O Placement : Yantra energizes the location where it is installed. You may place it near the entrance of your home/office/shop or in your living room or reception or study room or office cabin. You may keep it on a table or use as a wall hanging. Yantra may be placed facing North or East direction. For meditation purposes, it is best to Install the Yantra in the North East direction of your dwelling. North-East is also called Eshaan corner and is recognized as the place of God. This direction is seen as highly charged place as it is the confluence of energies coming from the North magnetic pole and sun rays from East. The Yantra placed here gets charged with divine vibrations from universe and provides positive transformation energy/energies to the dwelling through its mystical geometry. This is one of the most outstanding of highly valued and auspicious Yantras, representing Lord Mahamrityunjaya Shiva. Worshipping of this yantra, bestows health, happiness, good fortune, and fame. It dispels anxieties, phobias, fears, ill effects of malefic planets, ghosts, diseases and accidental death. The holy water after the puja of this yantra, may be sprinkled around the home for auspiciousness and for keeping away diseases and other calamities. O Mantra : Om Hoom Joom Saha, Om Bhu Bhuva Swaha, Om Triambhakam Yajamahe, Sungandhim Pushti Vardanam, UrvaruKamiva Bandhanat, Mrityor Muksheeya Mamritat, Om Swaha Bhuva, Bhu Om Saha, Joom Hoom Om ! 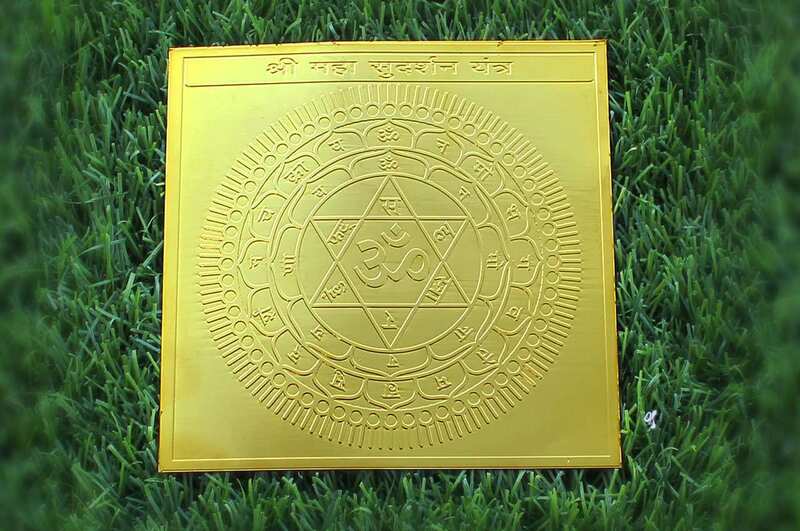 O Design : This Yantra is engraved on a square plate of 24 ct gold plated copper and has been specially energised to radiate its beneficial powers. Yantra to destroys all the evils , and protects the person from all sorts of difficulties. To get rid of all Perils, Obstacles in the way of your success, gain, all round prosperity, fame and luxuries. This Yantra is the prime protective Yantra. The Sudarshan refers to the discuss of Vishnu, weapon to repel and punish evil and it is constructed from the pure flame of the sun. It is a dynamic Yantra in that the construction represents whirling wheel of sacred flame that keeps all negativity, illness, misfortune and so on at bay. Within the body of the Yantra are inscribed sacred beeja mantras or seed syllables that have proven their efficacy as protective talismans. When worshipping this Yantra, the devotee visualizes himself being in the centre of this sacred circle of sun-fire, secure and protected from all harm and ill that might befall him/her. O Mantra : Om Namo Narayanaya ! Lord Brahma symbolizes the aspect of the Supreme Reality that brings forth the creation. He is the first member of the Hindu Trinity that also includes Lord Vishnu and Lord Shiva. His divine consort is Saraswati, the Goddess of learning and knowledge. Goddess Saraswati provides Lord Brahma with knowledge that is necessary for the process of creation. 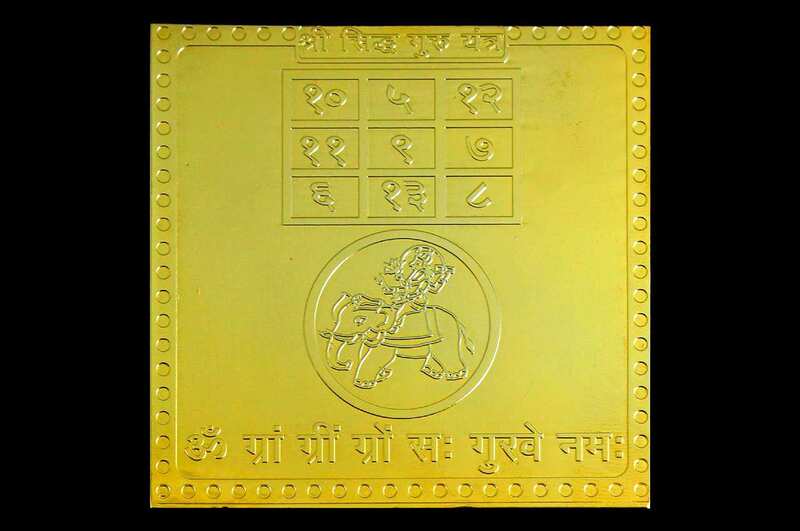 This Yantra invokes the blessings of Lord Brahma and gives benefits as below.•	Enhancement of creative power, focus, learning and knowledge, wit and intelligence.•	Enhancement of communication skills and vocal power.•	Recommended for Project leaders and those involved in High level creation activities. O Mantra : Om Chathur mukhaya VidmaheHamasaroodaya DheemaheThanno Brahma Prachodayath. 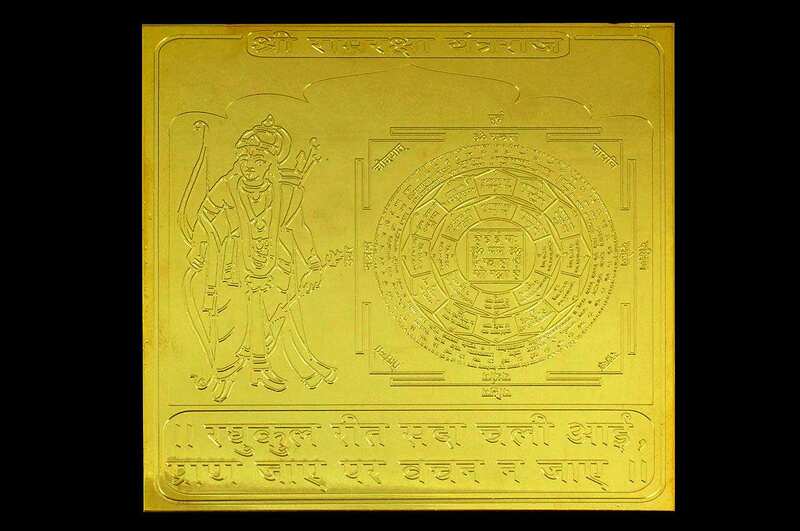 Yantra for worshipping Lord Krishna . Lord Krishna is the eighth incarnation of Shri Vishnu, the protector and preserver of this universe. Krishna came to this holy earth to give pleasure to His devotees, which are very dear to Him. Krishna does a lot of lilas (attractive pastimes) for the pleasure of his devotees. Krishna means the one who is 'All-Attractive' . Krishna attracts his devotees so as to make them more and more immersed in His love. This love for Krishna takes them (devotes) to a level of joy where none else can reach. Spreading this joy is one of the prime objectives of Krishna's incarnation and pastimes.Lord Krishna Himself says this to His devotee Arjuna in Bhagavad Gita. I manifest Myself personally, whenever there is a decline in righteousness and predominance of righteousness We must understand that if we become true devotee Krishna will take care of our needs and joy. We should leave everything to Krishna and involve ourselves in His love. It is sure that Krishna will take better care of us than ourselves. All evil spirits fear from Him and where puja of Hanuman Yantra is being done. Enables Healers to strengthen their ability to transfer healing prana. An outstanding yantra of great values. The use and upasana of Shiva yantra is worship of Lord Mahamritunjay Shiva and is most auspicious and bestows the person with health and happiness, good fortune and fame. Shiva is represented as destroyer only to create. He is the God of Love, music and beauty . His Grace is boundless. He is the Saviour and Guru. He is Satyam, Sivam, Subham, Sundaram, Kantam. He is the Supreme Light that shines in your heart. He is Param Yogi.His worship opens the conciousness in you to realise God within . He is the protector and saviour . 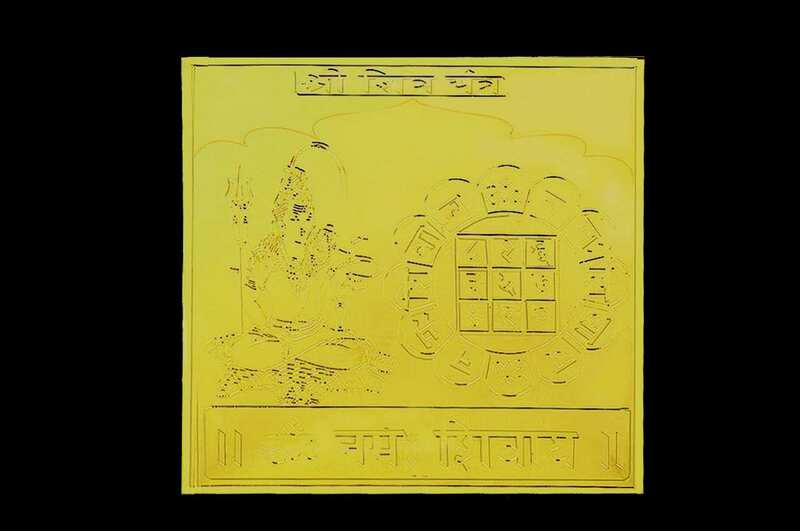 This Yantra is etched with Mahamantra of Lord Shiva which is Om Namah Shivaya. 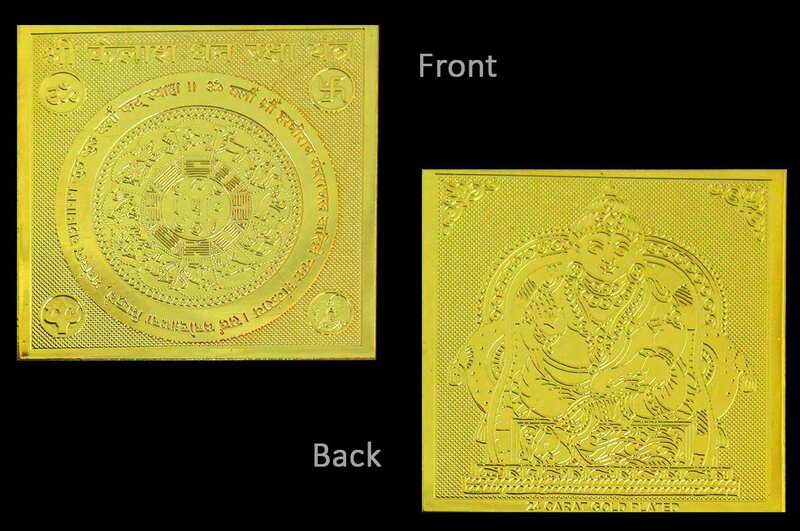 This Yantra is one of the most effective Yantras for gaining wealth. 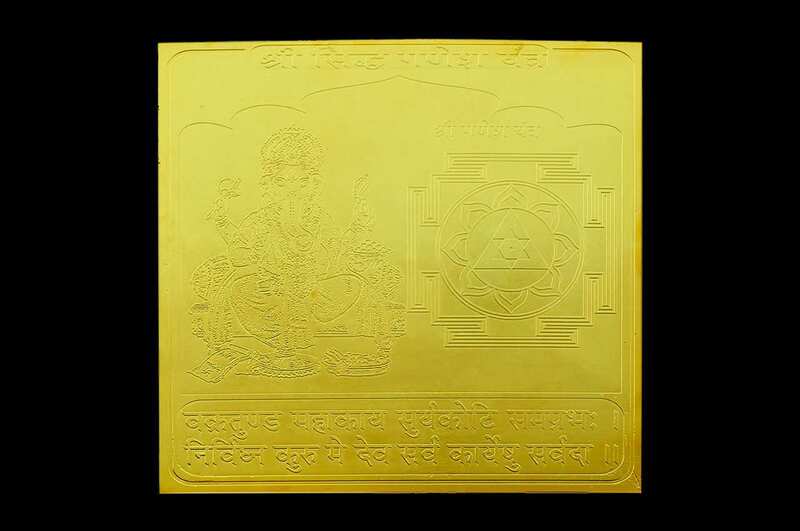 Shri Adya Shankarayacharya used this Yantra for arranging rain of gold balls. 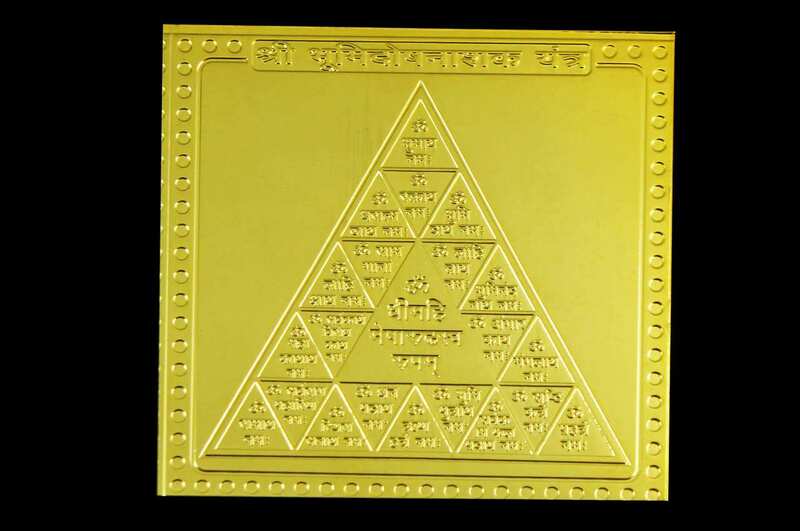 This Yantra bestows Ashat Riddhi and Nav Siddhi. Its puja is performed through Kanak Dhara Stotras. 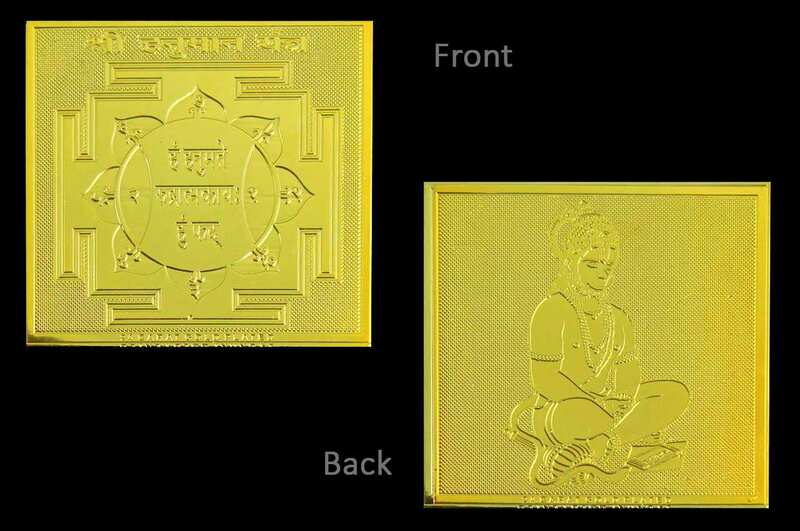 This is kept in altar and cash box so that the wealth inflows stays forever. O Mantra : Om Hreem Sahastravadney Kankeshwari Sheegram Atarva Aagachch Om Phat Swaaha. Yantra for obtaining the blessings of the planet Moon for balanced emotions, friendship, relationship, respect, health, harmony, removing ailments and improving intuition, creativity, feminine energies and flexibility. Also for placating the planet Moon in a horoscope that shows a weak or debilitated Moon. Yantra for worship of Lord Jupiter for blessings in prosperity, power, rank, authority, abundance, wealth, business and for strengthening a weak Jupiter in the horoscope with pooja and mantra. 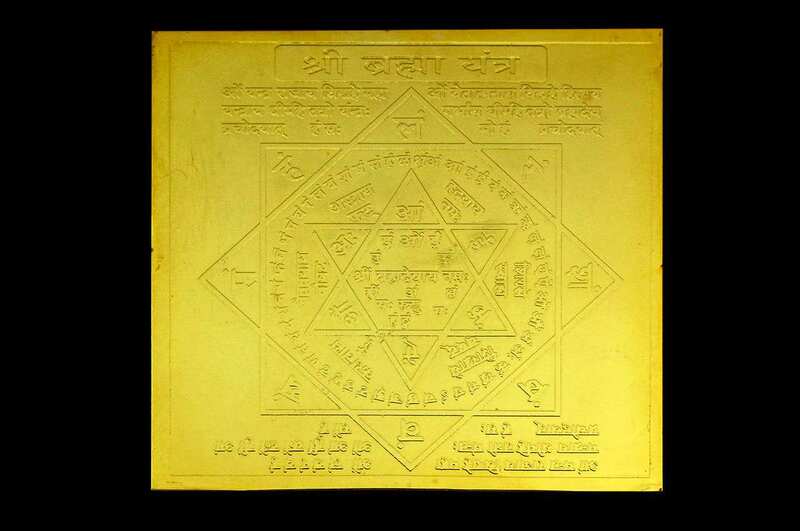 Yantra for worship of Lord Mars; recommended for those with Mars afflictions or Kuja Dasha in the horoscope or going through malefic period of Mars transit. Worshipping and chanting the relevant mantra will placate the planet Mars. 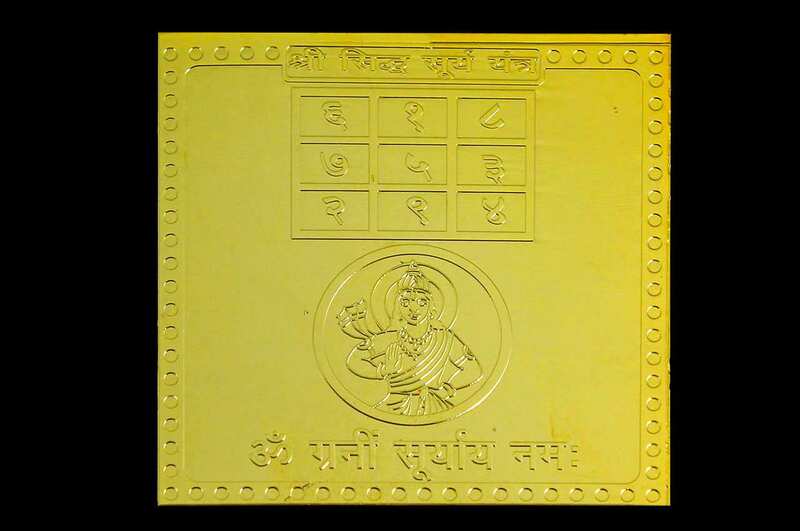 Yantra for gaining the blessings of the shadow planet Ketu, removing diseases, evil energies, hidden enemies, adverse situations and negative conditions. Can bestow all round successes. Sun has been given special significance in Vedic astrology. It is considered to be the most powerful planet among all nine planets. It is also known as the Atma Karaka of the soul. All the other eight planets revolve around the Sun itself. According to the astrology, every individual on this earth is affected by the movement of signs, nakshatras and planets. An afflicted Sun makes the individual lose name, fame and position of honor. The person loses strength and energy in the face of challenges. Worries, stresses over past and future take control over his mind. In such situations, installing a Sun yantra in home/office bestows him with auspiciousness of the Sun. Surya Yantra Puja: This yantra should be established in your home/office on Sunday at Sunrise. 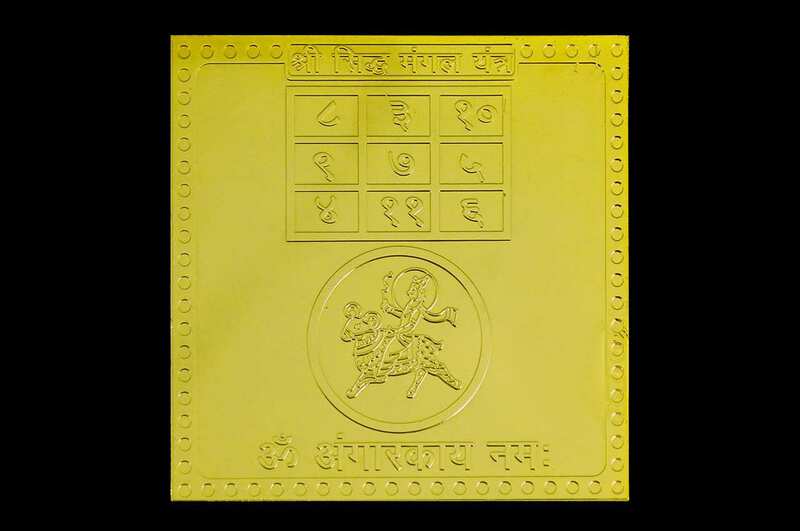 Wear Yellow clothes after bath and install the Yantra facing East on a Yellow altar cloth. Apply sandalwood paste and offer red flowers to worship the yantra. While performing the puja the worshipper should chant, "Om Hraam Hreem Hraum Sah Suryaya Namah". 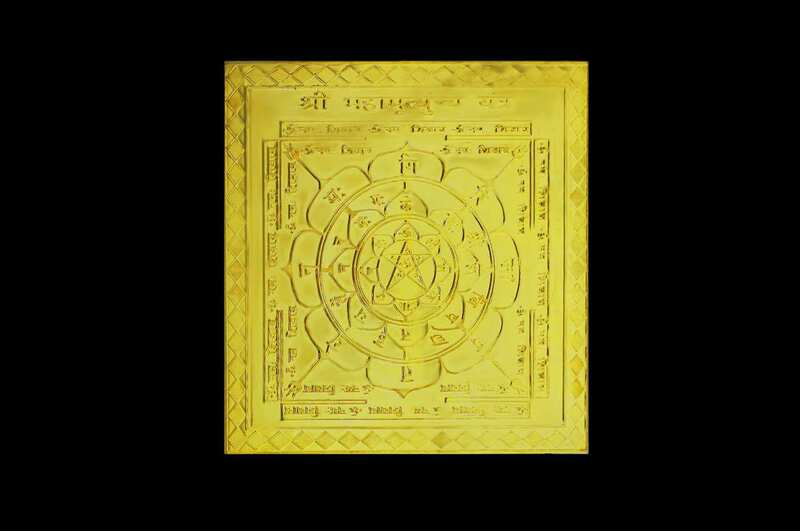 Yantra for worship in the home temple for protection against evil spirits and black magic. Property, progeny, conveyance and protection against vehicular actions can be achieved with this yantra. O Mantra : Om Dhimahi MeshRudraSwaRoopam !